Have you heard of autism? No? Really??? Do you live under a rock? Of course you have heard of autism. So what do we need awareness for anyway? This is my first April as an “autism mom.” The first year since my son was diagnosed as being “on the spectrum.” And I’m a little uncomfortable. First of all, there’s this underlying feeling that I’m not a REAL autism mom. My son has a triple diagnosis (ADHD, mood disorder and Autism Spectrum Disorder, or ASD) is extremely (incessantly) verbal and is gifted. So autism feels like just one ingredient in this alphabet soup, and it was the hardest one to find and last one to be diagnosed. We thought he had other challenges, but he was long past early intervention age when it was discovered. All things being relative, his autism isn’t as severe as many others. The second reason I am uncomfortable is that now that I am a card carrying member of the autism community, I am deeply aware of how much conflict there is. This is a disability no one can agree on! If you spend any time at all on the interwebs with other autism parents and autistic adults, there’s a lot of debate going on. 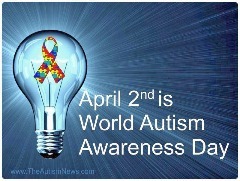 Issues include awareness vs acceptance, person first language vs identity language (person with autism vs autistic), labels to describe level of functioning, whether or not Applied Behavior Analysis is actually torture, support vs loathing for Autism Speaks (the single largest autism charity) and subsequently the colors and symbols used to raise awareness, vaccines, policy goals, and research. Im overwhelmed by it honestly and I considered just putting my head in the sand and ignoring autism awareness all together. But that’s not who I am or what I am about. I’m going to dive into those issues and more this April. Just not in this post. I am “lighting it up blue,” apologies to those who don’t like it in advance. I’m all in on the puzzle piece and the color blue because it is simply recognized. Raising awareness works better when everyone can come together and that’s what I want to be a part of, the coming together. Back to the question why do we need awareness? Early Intervention. My son is not a typical anything, including autistic. We were hyper aware. We were looking for it. He just wasn’t destined to be figured out early on. Most cases of autism though can be caught by age 2. Early intervention services can make a huge difference in an individual’s functioning and some version of services are offered in most states. If people aren’t aware of the symptoms of autism, they can’t identify it. This remains the most important reason to raise awareness. My husband and I are not bad parents. My kid is not a bad kid. Sometimes, out in the world, autism happens. It would be great if more strangers had a clue and were kinder and less judgemental. No matter how you slice it, the rates of autism have grown at a staggering rate. It is not fully explained by increased awareness or changing diagnostic criteria. I would like to know why. In most cases, including my son, I believe genetics play a dominant role. It’s not the vaccines. If there is some environmental factor perhaps triggering genetic predispositions, we should know so we can slow this train down. So we need research that will determine the actual causes of autism, as well as research on effective treatments. A surprising number of people do live under a rock. They are scared of autism. They act as though you can catch it. They have no idea what to expect. They exclude based on stereotypes. They are nasty trolls on the internet saying hurtful and mean things to autistics and autism families. They arrest and sentence people with disabilities essentially criminalizing autism without any idea what they are doing. Talking about autism makes a difference. Support! In part because I write about it, a number of friends with kids even newer to this journey than I am have come to me for advice. There are so many mama guides who have gone before me that I have leaned on for both support and information on how to do our best to help our kid. We share resources, laughter and tears. I want the world to know more about our experience so they can relate to it if they are going through it and support the people in their lives that are if they are not. I have 568 Facebook friends. Thirty-five of them have autistic children. Granted there’s a lot of self-selection bias in there, but it is remarkable the number of friends I’ve known long before we became parents that are on this path too. So for me. For them. For us. Light it up blue, spread awareness and above all, be kind to one another. Thank you Shannon, for writing down your thoughts, giving me hours of advice, and listening. Some days or weeks we are good, others are not so good, and I feel I failed her miserably. But I get up the next day and try to be better. I am still debating on sharing very publicly about her diagnosis, and I am not sure why. Maybe I don't want her to be labeled, I don't want the "I'm sorrys," but I do want to spread understanding. So, thank you for writing this. As for sharing, lest ye think I'm #sobrave, let's look at a timeline here. You do not need to be a hero. You are not responsible for spreading any more awareness than you are comfortable with. I took a long time. November 2012: Child does super disturbing thing that lets us know we can't parent our way out. March 2013: DX with ADHD & mood disorder. Begin trying drugs. June/July 2015: I "came out" about it all to personal connections on Facebook, started this blog, and he received the autism DX kind of simultaneously. This blog gives me so much comfort. And an ego boost. It really is all about ME. And it's my thing. I get off on some exposure for my writing. I shop it to the mighty and scary mommy when I'm really proud of a piece, which is unpaid. I really really want to get in HuffPo. It's pure ego stroking and emotional processing rolled into one. And it's far more pleasant than therapy. It's my "self-care" routine if such a thing exists. Because of the fact that I am aware who this is really for... You will never find his name or picture on this site. And he has a different last name. Particularly because I need to write things that are honest and raw, well I don't need some employer 20 years from now to read about him as a kid on my blog. So not only should you not feel pressure to come out before you are ready, depending on how public you go, I advise caution. Know how you really feel about talking about her and set ground rules that make you feel comfortable before you ever make a peep. If by going public you mean a little closer to home than a blog, that you occasionally even advertise because you are just that much of an attention whore, get the messaging on point first. Seriously, it will go smoother and you will be more grounded for any response that may come your way. Great post, Shannon. While most people have heard of autism and may have a vague idea of what the term means, there are still many misconceptions to dispel. We can all benefit from learning more about ASD and how to be supportive of families living with the challenges it brings.